Like many of the conquistadors, Pedro de Alvarado came from one of the poorest regions of Spain called Extremadura. Pedro’s peers considered him fearless, ambitious, as well as cruel. His bravery and his brutality are well documented. Alvarado was fair-haired and very handsome. He loved to wear gold necklaces and jewels. The Indians called him Tonatiuh, the golden sun god. He landed in the New World in 1510, just in time to participate in the conquest of Cuba. Pedro and his brothers were aware of the riches of the Aztec Empire when they decided to join Cortes and his expedition in 1519. Bernal Diaz del Castillo in his eyewitness account describes Alvarado as a good leader and frankhearted. He was a great horseman and a natural born leader of men. 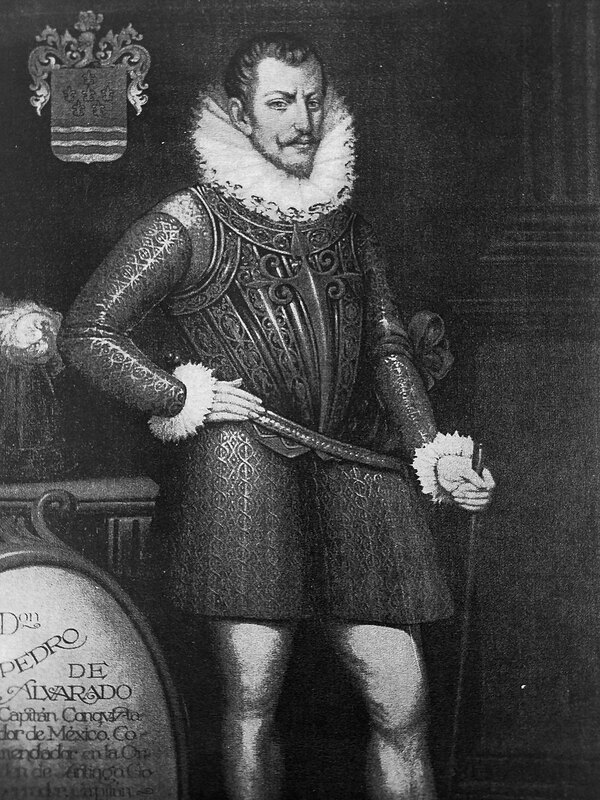 Pedro became Cortes’s most trusted captain. However, even Cortes complained of his brutality. Especially, after he slaughtered hundreds of innocent unarmed Aztecs who were celebrating in front of Aztecs main temple in Tenochtitlan. The slaughter touched off a war between the Spaniards and the Aztecs forcing Cortes to flee the city. After conquering the Aztecs, Cortes and Alvarado still hungered for even more riches. They decided to invade what is now known as Guatemala. Cortes and Alvarado assembled 400 Spanish soldiers and over 5,000 Indian auxiliaries. The expedition left Mexico City on December 6, 1523. When they arrived in Guatemala they found a country that had been devastated by war and disease. Smallpox had been introduced to the Mayans by the first European visitors years earlier and by the time Alvarado and his men had arrived one-third of the Mayan population had died. There were so many dead people that the corpses lined the sides of the roads. Soon frustrated by the lack of gold, silver, and jewels, Alvardo began enslaving, branding, and selling the natives. The Quiche Mayans had ruled the Guatemalan highlands since the 14th century. It was the largest confederacy in Central America. Their capital was called Utatlan and it had a population of about 50,000. At the time of the Spanish invasion it was believed that the population of Guatemala was about 2 million. Constant warfare had forced the Quiches to abandon the cultivated valley floors that they had inhabited for 1,000 years and live in fortress mountain cities. Utatlan was positioned like a medieval European castle on mountain ridges, protected by moat-like ravines. Utatlan had population of 50,000, and it was extremely well constructed. When Pedro de Alvarado and his men arrived at Utatlan they asked the Mayans to surrender peacefully. However, the Quiches refused to cooperate. Hastily, their great leader Tecum organized 10,000 troops from the surrounding towns. Unfortunately, for Tecum, Alvarado had already convinced the Cakchiquel Maya to fight for the Spaniards in exchange for favorable treatment. By now the Quiche forces numbered 30,000. On a plain outside of Quetzaltenango both sides met in a fierce battle. The Quiches suffered a horrific defeat. Alvarado burned Utatlan to the ground. It had taken him just a few months to conquer the Quiches.